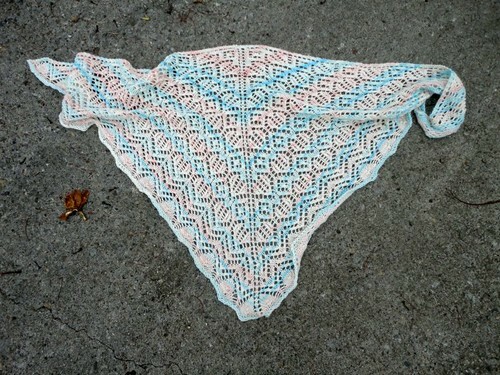 A little while ago I finished and blocked this shawl. This picture shows the stitches better. 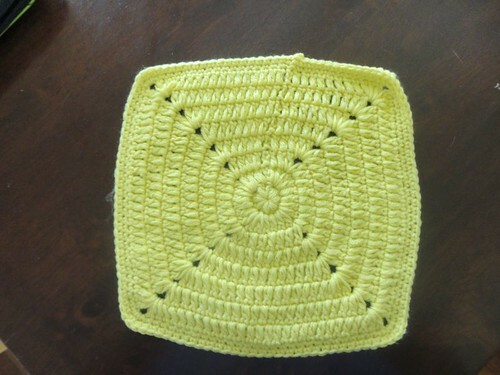 I also broke out the crochet hook and did an 8 inch square for charity. Nice way to get rid of some stash yarn. I’ll post it when I’m in Australia next. Hopefully that won’t be too long. I’ve been having some problem with my right foot. I acquired a cane to help me get around this week. Anyway our insurance company has approved travel to Australia for treatment, so as soon as they have found a Dr who can see me on short notice I’ll be off. In other news, there will probably be a lot less crafting going on as I have returned to university. I’m going to be writing a 60 000 word thesis over the next few years. My field of interest is the Republican Period of China (1927 – 1949). 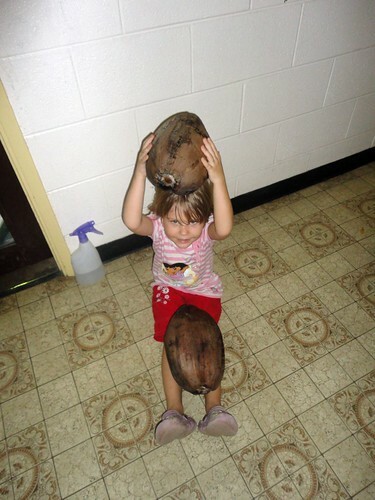 The coconut tree I wrote about in an earlier post actually turned out to be in our neighbour’s yard. 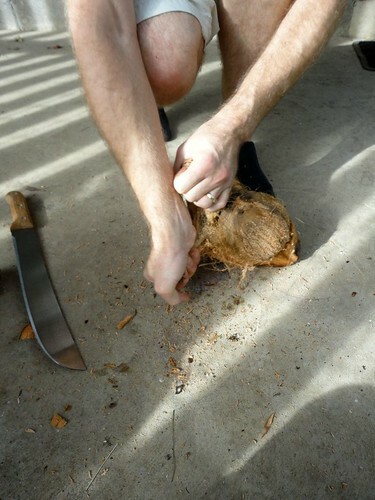 However, they don’t use the coconuts and so we are welcome to them. A little while back Gorgeous Girl collected these beauties. 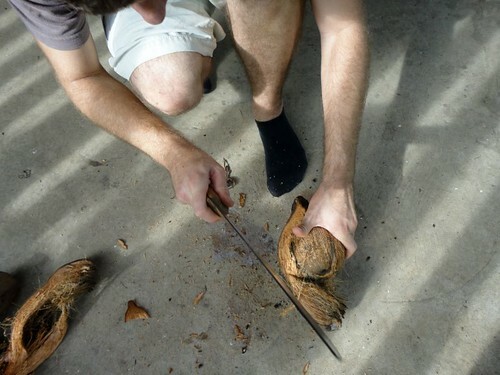 I have to confess that it was a surprise to me that coconuts had the extra shell. I always thought they fell off the tree like we see them in the shops. However, to get them to that point they need a bit of work. First you get a big knife. And cut open the outer shell. Then with very strong hands pull the round nut out. Then cut open and enjoy. 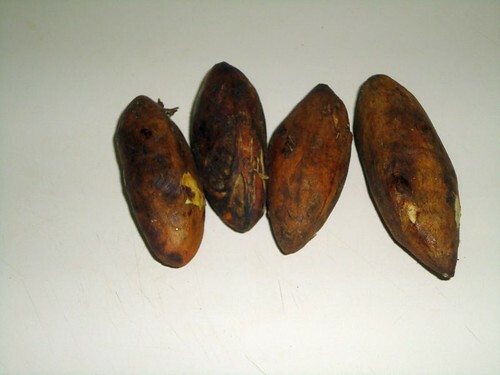 We’ve also been buying okari nuts at the local markets. These taste sort of like a cross between macadamia nuts and coconut. You peel off the brown skin and it’s a brilliant white underneath. These have become one of our favourite local foods. The bananas at the side of the house turned out to be cooking bananas so we left them for the parrots to enjoy, and we enjoyed watching the parrots. 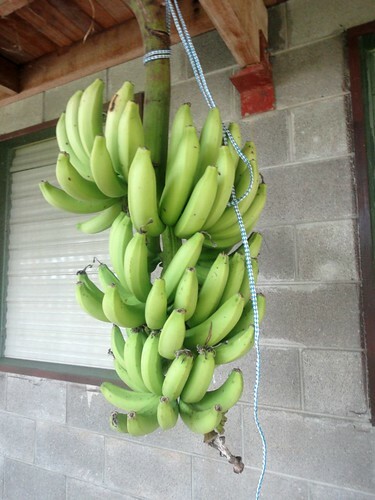 However, the bananas at the back of the house are eating bananas and are finally ripe. 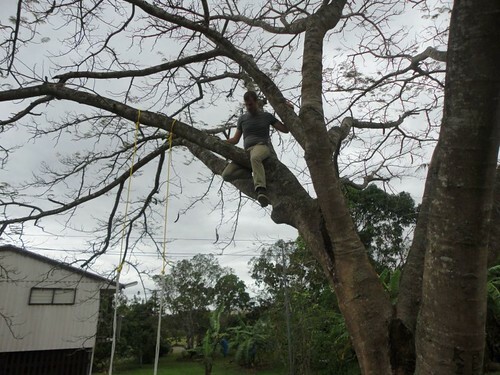 The bananas spent some time on the tree under a bag to protect them from the parrots. 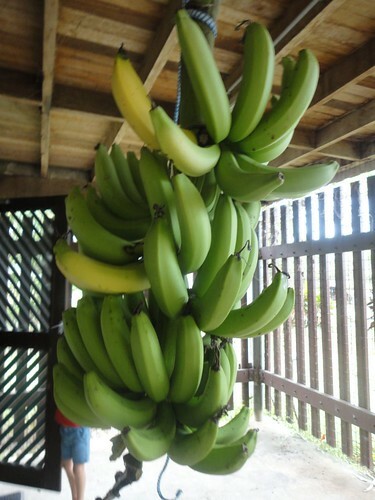 Yesterday we cut them (the tree is too dead to support them – banana trees die after fruiting) and hung them under the house to ripen. I’ve had one of the ripe ones, it was delicious! 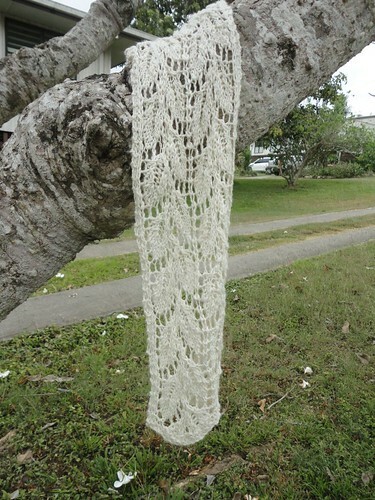 Finally, a scarf I made for Gorgeous Girl last year, but only got around to photographing today. 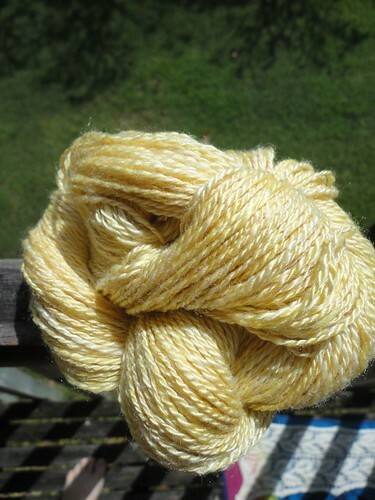 It’s early hand-spun from fibre which I dyed myself. Gorgeous Girl had book week at school last week. 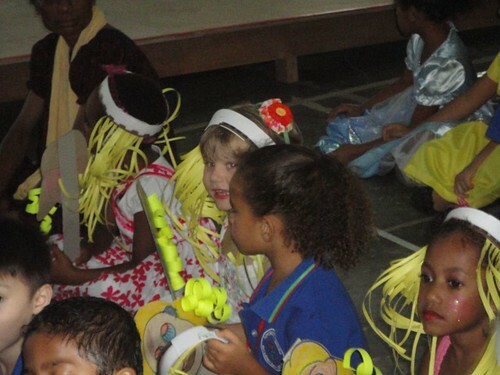 Her class dressed as Goldilocks and the three bears. Don’t you love the paper golden curls? 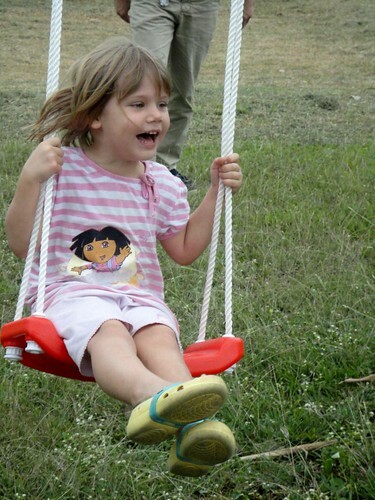 While we were in Australia we bought Gorgeous Girl a swing. We’ve been too sick to put it up until now. Gorgeous Man is not really that high up, our neighbour’s house is down a slope. 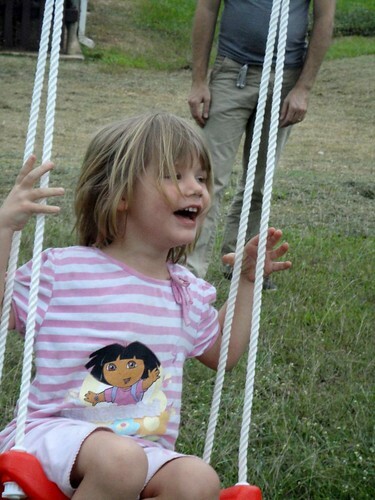 The pure joy on Gorgeous Girl’s face was wonderful to behold. 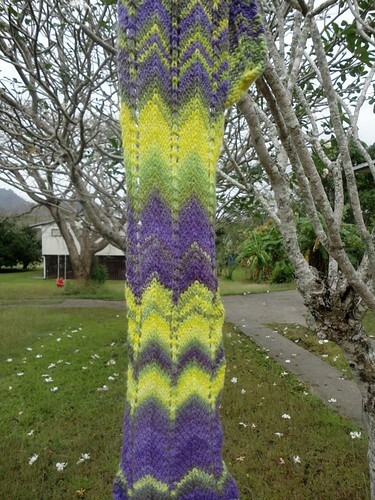 This knit was finished while we were travelling in Zambia, but it’s taken until now for me to block it. 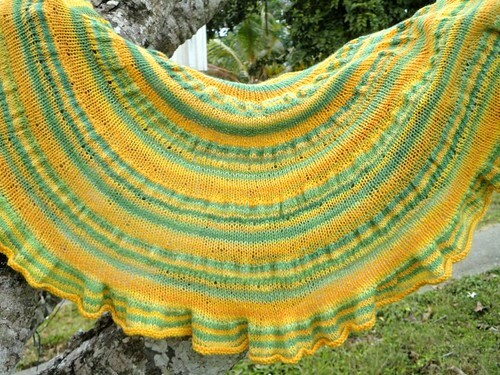 The yarn is handspun from fibre that I dyed myself. Navajo-plied. Details here. 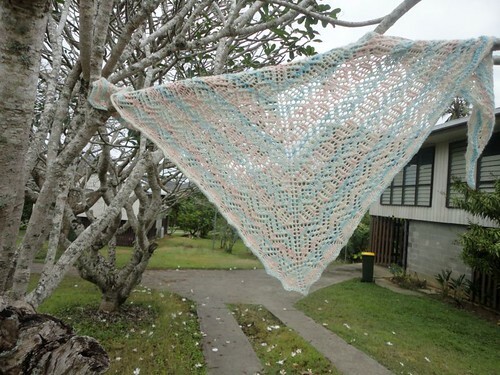 This was my Australian holiday knitting. Bamboo and silk slubby yarn. 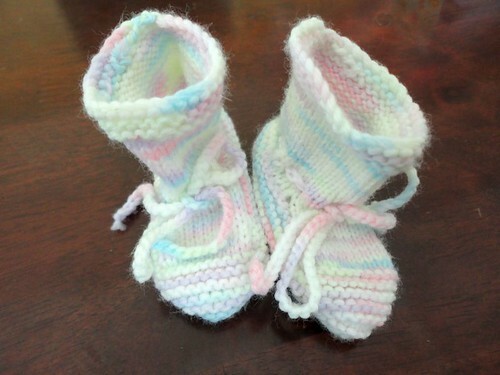 A pair of small booties for charity. These will go to the local public hospital. These were a quick knit. Two evenings watching the Olympics. I had to fiddle with the pattern a little to make it work, so I’m not sure I’d use it again. I’m working my way through the fibre stash. This is 100% silk. I was aiming for a smooth spin, but it’s a bit fluffy. It’s lovely and soft though and will make a nice scarf. This little guy has been knitted for a while, but was lacking eyes. They got added today. (The view is our side driveway which goes to the front door under the house). The feet are mostly handspun yarns with a few yarns I received from swaps. I free-hand cut the eyes, glued the black centre to the blue and then blanket stitched the blue on. I seem to have lost my embroidery thread, so just used sewing cotton double over. (I’m sure hopeful the embroidery thread will turn up, I just don’t feel like going through the craft tubs at the moment). Here he is in his natural habitat. However, he probably won’t stay here for long. Dry season in PNG seems to be the time when lots of grass is burned. As we have no glass in our windows, the house is continuously filled with a fine layer of ash and asthmatic me is having problems breathing. 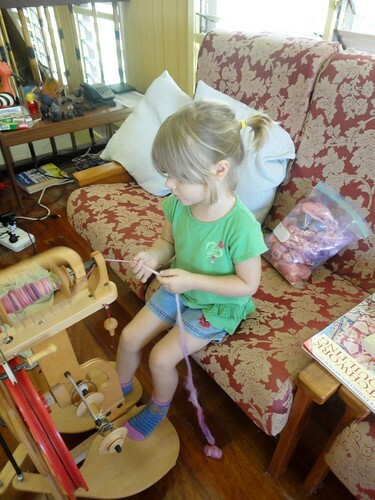 Gorgeous Girl has shown a renewed interest in spinning. 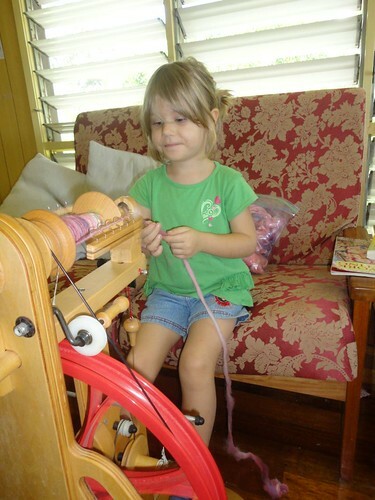 This time around we are working on drafting and not just feeding the pencil roving onto the bobbin. This is top that I dyed myself back in South Africa. The beautiful 🙂 couch comes supplied with our house. Gorgeous Man gave me quite a scare this last week ending up so sick that he needed 2 doses of IV antibiotics. They have done the trick though and he is looking 100% better than he was, though he still has a way to go before he’s back to full strength. I’ve been enjoying knitting while watching the Olympics, a lovely lace shawl and some charity baby booties are currently on the needles. 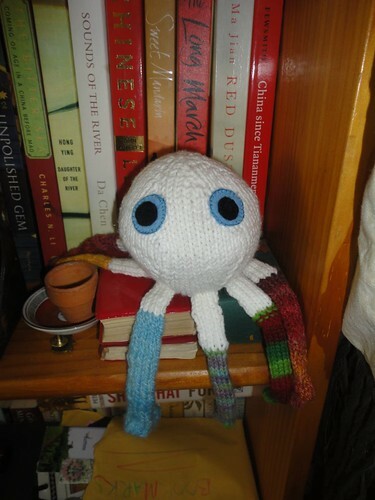 When Gorgeous Girl’s yarn is finished and set I’ve promised her I’ll knit it into a monster that she spied in my Ravelry queue. No point in knitting her a hat with it. It never gets cold enough here to wear one. Our trip home, as lovely as it was, made us all sick and we are only now starting to feel human again. I had a chest infection, Gorgeous Girl woke up with infected ears at 3 am the day we flew home (good thing was she slept for most of the flight home…) and Gorgeous Man got the flu. We are now fully acquainted with the private medical clinic here in Port Moresby and are feeling much better. 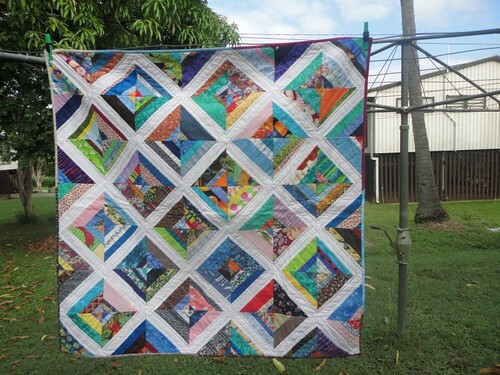 Today I received word that my quilt had arrived at it’s destination, so I can show you a picture. I’m really pleased with how this turned out. It did have it’s challenges at times, but it’s amazing what a run through the washing machine can do to finish a quilt off. This was 100% from stash, including the backing and included fabric from every quilt I’ve made. I’ve got the binding cut to add to my second quilt of the year. I’m looking forward to having that finished. 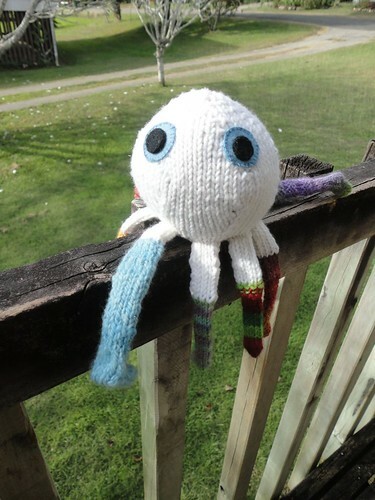 There has also been some knitting. 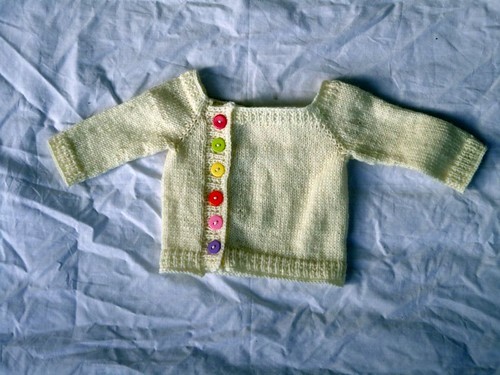 A little cardigan for charity. 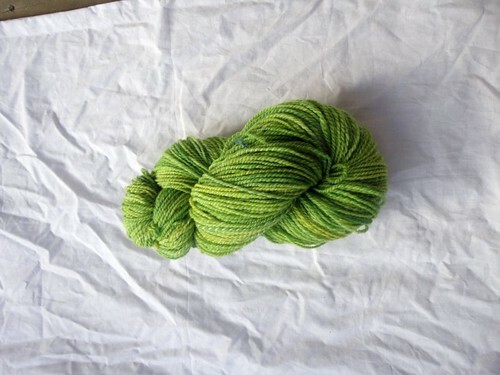 This was a gorgeous fibre from Nurturing Fibres in South Africa. 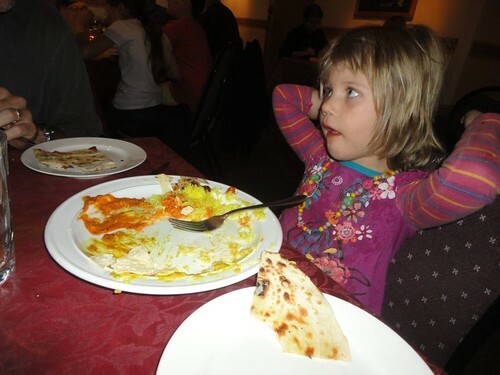 Finally a picture of Gorgeous Girl enjoying a curry on our last night in Australia.